Up-to-date safety training quickly put into action by a school bus driver ensured that one of her young student riders was alive to greet her the next day. Jean McKeag, a school bus driver of six years for Northern Local School District near Columbus, Ohio, was loading up students at Thornville Elementary for the ride home on the afternoon of April 27, when trouble struck. Some students that had already boarded reported to McKeag that first-grader Quade McCance was choking on a piece of hard candy. McKeag quickly jumped into action and administered the Heimlich Maneuver to the boy. She was able to dislodge the Warhead candy, and the school called Quade’s mother Jessica McCance. to let her know what had happened. McCance was so grateful, she later wrote to district Transportation Supervisor Dale Factor to praise his driver. 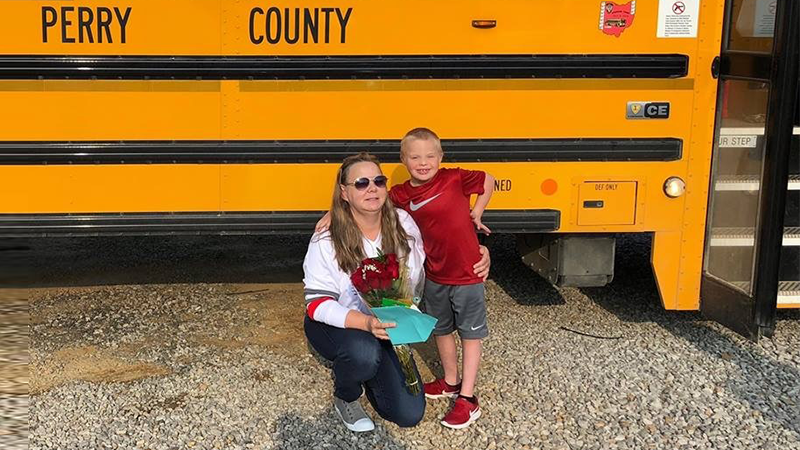 The McCance parents demonstrated their thankfulness by asking Factor and district Superintendent Thomas Perkins to meet them at Quade’s bus stop, where they presented McKeag with a card, flowers and a gift card. Factor later told School Transportation News that all district drivers are trained in basic first aid and CPR, which includes the Heimlich. Training is usually renewed every six years, but McKeag had just completed her recertification earlier this year. Factor said that he is considering implementing more frequent and more in-depth training as a result of this practical demonstration of its usefulness. We “always like to try to get good press out there, rather than all the bad press you see so often,” he added. “It takes a village to raise a kid and I’m so happy our village is Thornville and the Northern Local School District,” declared Jessica McCance. If you know of a school bus driver who did something amazing for their student riders, let us know and they could be featured in an article at our website.